The Houston Wing Tsun Backyard's brand new website was just launched. Due to the limited nature and organization of blogs like the one you are on now, it is impossible to present the wide range of information about Wing Tsun in an easy to access and easy to appreciate way. Please click here or on the title to this article above to go to our website now. Thanks for your interest. See you over there. Tired of 'Same-Old Lame-Old' Martial Arts Training? It's not a matter of "style" or system, but a matter of the nature of the training. In most systems, you simply stop learning after you reach instructor level. In Wing Tsun, that's where you start learning for real. Before then, training is just a matter of giving you the tools you need. After you make it to instructor level, you learn how to use all of those tools, reflexively, instinctively, according to what your attacker is actually trying to do to you you. 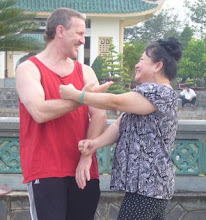 Translated into Wing Tsun terms, you are an instructor once you have learned the first two (out of of three total) empty hand forms (called "Siu Nim Tau" and "Chum Kiu"), and digested the first four sections of "chi sao" ("clinging arms" training) applying the movements of the forms and combining them with basic fighting footwork. Later, you learn the third form ("Biu Tze") while completing the remaining two sections of Chum Kiu chi sao. five chi sao sections that go along with it, and making all of the above fluid and purely reflexive. Then come five sections of Biu Tze chi sao, and finally the Wooden Dummy form with its four chi sao sections. The Wooden Dummy training is the last phases of empty hand practice. When you can deliver all of that in a fluid and reflexive way during free fighting, you progress to the two weapons forms in Wing Tsun: Long Pole and "Bart Cham Dao", which are a short form of double broadswords. Bart Cham Dao training has the most advanced footwork in it, but of course you learn elements ofthat mmuch earlier in your training because - after all - you are supposed to learn how to fight, right? There's no point in holding it back. There are only different contexts of that footwork that won't be taught until you have understood and mastered a lot of the other techniques. Naturally, there is also the "chi gerk" or clinging legs training in which you learn to defend and counter attacks to your lower body with your legs while you continue to fight with your arms "upstairs". All of that should take no more than five years, max, if you train hard. So, at the end of all that, are you "done"? Once you make it through the whole system, you circle back to the first form, Siu Nim Tao, and discover that it was actually the "last" form in Wing Tsun (in terms of when it was developed) because it has elements of all of the other forms in it. It was just put "first" because that helps beginners get a foundation and a frame of reference for everything that is to come. So, once you "finish" the system, you have only completed your first cycle, and you go back to Siu Nim Tau and recognize, for the first time ever, how much of the most advanced concepts in WT are already in there. From there, with your new understanding of what is actually in these forms and how to apply it, you go back through Chum Kiu and Biu Tze, the Dummy and Weapons forms and training again, and again, developing an ever higher level idea of what these are really all about. Naturally, this time it won't take you five years to get through it because you have long since become an instructor yourself. In the process of all this, you literally and truly make Wing Tsun a part of you. That process becomes an endless cycle. Every time you cycle through the system, you go one step higher - and higher - and higher still. It never stops. That's why it's called "wing tsun". That Chinese name for this art can be translated into English as "eternal springtime" or "forever young" because you will never stop growing. You are always new, and so is your ever brand-new, personal brand of ... well, some call it "wing tsun", but in the end it's just -- you. If you are a "Backyard" Wing Tsun member, please make a note of our next Seminar day with Sifu Simon Mayer from San Francisco. He will continue to bring us up to speed with his super-effective teaching style. Last time was just a small taste since everybody had to get used to him first. In May, we will diver right back in, so come to class and be prepared! Compare the quality of the Lat Sau inthese two videos. The first shows Hong Kong Lat Sau performed by students of a teacher in Canada who actually learned in Hong Kong and who is a highly ranked direct Leung Ting student. The second is from Sifu Patrik Gavelin in Sweden who is a second and third generation student of Leung Tings. The tent (20X20 ft.) is going up this weekend. Now our backyard has a roof for when it rains. The porch has gotten too small for our growing numbers. This new luxury comes at a price, though. Now, there is more room for footwork: steps, kicks, punches, and multiple opponent circle-fighting drills - and that means you'll sweat more. Got a few pounds to lose? Might as well lose them here at the Backyard. At least here you are getting something in return (grin). Looks like more and more new students are signing up lately, and that without any more promo activity on my part. Great. We're ready. The new Student Grade (S.G.) teaching program (Levels 1 - 3) has just been distributed. It's pretty ambitious. Wing Tsun is supposed to be taught fast, so let's see how much everybody can digest without getting indigestion. Student Grade testings are free (no extra charge for testing and certificates, etc.) and will now be available every two months instead of every three. Sihing Jean has just been promoted to Assistant Instructor to help me teach the new students coming in and leading the basic training drills. He will get free private lessons in return. Congratulations, Jean! Mo., Wed., & Thurs. : 6:30 - 8:30 pm. One class/wk: $65/mo. ; two classes/wk: $90/mo. ; three classes/wk: $110/mo. Membership in Bay Mountain Martial Arts US Organization: $60 per year. "Alex, I would like to thanks again for the training. If you are someone looking for a wing tsun teacher I totally recommend Alex. I learned so many techniques in one day I could just imagine how I would be when I keep training with him. In one day I have more confidence in my fighting ability and my stamina increase. I cant wait until the next class and thanks again. See you next week.” Thurman N.
It's what gives you the confidence to stay relaxed, focused, and effective, even under the most serious pressure - when your life depends on it. WT has special exercises (called "chi sao" and "chi gerk") that literally turn your body and mind into a virtual fighting machine on autopilot. It helps you learn more about yourself (your body, your mind, and how they work together) than you have learned in a lifetime. It's also way more fun and exciting than anything else you could do for that little money. In other words - it's for YOU. Alex started his WT career in 1981 in Germany where he met his first Sihing, Curtis Dittrich before moving to the US. In the US he has studied under Sihing Curtis from 1982 until 1983, then under GGM Leung Ting (from 1984 to 2005), under Sifu Thomas Dolnitzki from Germany (from 1988 to 2009. Sifu Thomas tragically died in September of 2009), under Sifu Emin Boztepe (from 1992 to 2000), Sifu Simon Mayer (since 1994), Sifu Scott Baker (since 2009), and most recently Sifu Martin Hoffmann from Germany. He has been teaching publicly and privately in Houston, TX since 1987, but left the Leung Ting organization in 2005 for political reasons (meaning he was fed up with organizational politics and the string-along teaching style). Alex holds a 2nd Level T.G. from Bay Mountain Martial Arts. For a lot more videos, please visit our YouTube Channel. I have absolutely no qualifications for lecturing anyone about anything. I do have the absolute God-given right to think what I want and to say what I think. This blog reflects what I think. Whether you take what I say to heart and act on it or not is up to you - as is wanting to save your country.